Disney will keep you hooked with its twisted puzzle game. When we hear the words "Disney" and "iPod Touch/iPhone", we usually think of some overmilked license, like Pirates of the Caribbean or one of its many animated films. 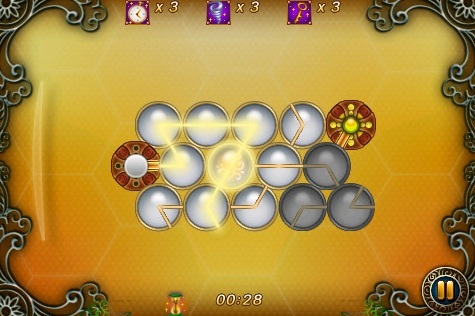 However, LUMA is a simple puzzle game that's both addictive and reasonably priced, two things you don't see that often. The game has some things in common with Atlus' Droplitz. It uses similar circular pieces with bent angles built into them, and the goal is to create a highlighted line. However, rather than moving rapidly (like Droplitz), LUMA requires a heavier dose of concentration. 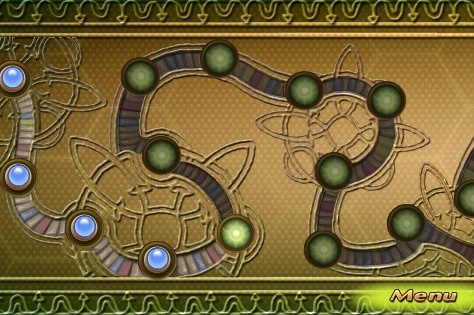 Over the course of the game's Adventure mode (which consists of 30 stages), new challenges arise, such as changing the color of the traveling line via a router, or creating two alternate paths at once without shifting a piece out of place. To do this, you must highlight pieces on the board and rotate them in 60-degree angles, using a touch-sensitive arc on the left side of the screen. Once you get through Adventure, you'll unlock Survival mode, which adds more complications. A time limit is now in place, and you have additional tools to help you out, including a clock reset and the ability to eliminate unnecessary pieces from the board. They're in limited supply, however, and once you use them all, you can't get them back during that round. Fortunately, you can save your progress and come back any time. That's really all the game has to offer, but considering the one-dollar price tag, it's a phenomenal value. Once you complete a puzzle, you can shoot for a faster time or search for a route that uses less pieces. Survival Mode requires a little more patience, but it's fun to try and beat. Unfortunately, there's little reward once you finish the game. New wallpapers are available, but we would've preferred more puzzles or additional modes. At least the game looks and sounds pleasant. The colorful screens won't hurt your eyes, and it's a breeze looking at and managing all the pieces on each board. The background music isn't amazing by any means, but you'll enjoy listening to it, especially with headphones. LUMA is a straightforward puzzler with the right amount of presentation and challenge, and it's perfect for just about any budget. We would definitely like to see more games like this from Disney in the future. What's Hot: Gameplay is both addictive and easy to get into, Survival Mode will test your piece-shifting skills, relaxing music and bright visuals, only a dollar. What's Not: Only 30 puzzles in Adventure Mode, not enough rewards to unlock.